Wsparcie - Trooper. Koszt: 4. 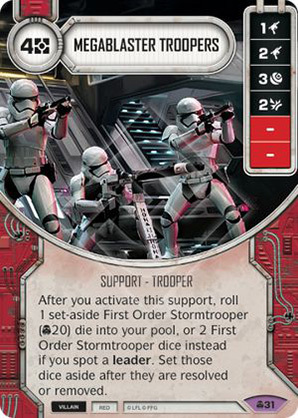 After you activate this support, roll 1 set-aside First Order Stormtrooper ([CONV]20) die into your pool, or 2 First Order Stormtrooper dice instead if you spot a leader. Set those dice aside after they are resolved or removed.